Once you know what the problem is you need to come up with ideas on how to deal with it. Research clearly shows that having more ideas is better. Hence, the goal of the tools within this section is to help you come up with many, many, many, more creative ideas. How would you begin to try and understand the complexity of the brain with its 100 billion neurons, each connecting up to 10,000 other neurons? One way might be to use an analogy such as a large telephone network, or the internet. You could ask yourself ‘how is the brain like the internet?’ Well, the internet contains many millions of linked computers interacting across space and time – rather like the neurons in the brain. The point is that by generating an analogy you can think of an issue or a problem in new and different ways which will help you to generate more creative ideas. Research has consistently shown that use of analogical thinking can benefit creative problem solving. Dahl, D. W., & Moreau, P. (2002). The influence and value of analogical thinking during new product ideation. Journal of Marketing Research., 34, 47-60. Mayer, R. E. (1989). Cognitive views of creativity: Creative teaching for creative learning. Contemporary Educational Psychology., 14(3), 203-211. Whenever you are faced with a problem you invariably make a number of assumptions about the problem. These assumptions may be misplaced, they may be outdated and they can limit your thinking by creating an artificial barrier. To break through this barrier list the assumption, then reverse them and then link them back to the problem. Research has shown that using an assumption reversal tool can lead to the generation of more ideas. Hender, J. M., Dean, D., Rodgers, T. L., & Nunamaker, J. F. (2002). An examination of the impact of stimuli type and GSS structure on creativity: Brainstorming versus non-brainstorming techniques in a GSS environment. Journal of Management Information Systems., 18(4), 59-85. Brainstorming is a popular and easy way to generate more ideas. Research shows that if you keep the following principles in mind and this tool can significantly benefit idea generation. Research has shown that brainstorming can not only lead to an increase in the number of solutions but also produce solutions that are classified as more creative. Santanen, E. L., Briggs, R. O., & De Vreed, G. (2004). Causal relationships in creative problem solving: comparing facilitative interventions for ideation. Journal of Management Information Systems., 20, 167-197. Stroebe, W., Nijstad, B. A., & Rietzschel, E. F. (2010). Chapter Four-Beyond Productivity Loss in Brainstorming Groups: The evolution of a question. Advances in Experimental Social Psychology, 43, 157-203. Brainwriting refers to a modified version of brainstorming that involves each person being given a sheet of paper that clearly identifies the problem and contains a grid, usually with three columns. Each person is then required to write three ideas on his/her sheet and then either pass the sheet to the person on their right or return it to a central pile. This process continues, with each person building on previously written ideas, until a specified time limit is reached or the sections of the grid are all full. Evidence shows that the sharing of written ideas using the brainwriting tool can lead to better idea generation compared to verbal discussions. Heslin, P. A. (2009). Better than brainstorming? Potential contextual boundary conditions to brainwriting for idea generation in organisations. Journal of Occupational and Organisational Psychology., 82, 129-145. Madsen, D. B., & Finger, J. R. (1978). Comparison of written feedback procedure, group brainstorming, and individual brainstorming. . Journal of Applied Psychology., 63(1), 120-123. These tools can involve the use of random words and/or pictures, generally not related to the problem, which you then have to deliberately link back to the problem. The idea is that these words or pictures act as cues forcing you to think about the problem in new and different ways. 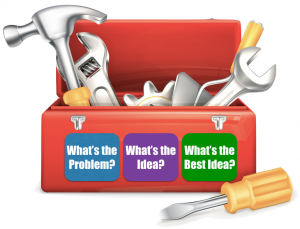 These tools can be used to help generate novel or unexpected combinations of ideas that in turn may help to create original and practical solutions. Research has shown that using randomly generated words or other cues leads to more creative ideas and solutions. However, it has been shown that using shorter lists of about 7 items is better than using longer lists. Daly, S. R., Christian, J. L., Yilmaz, S., Seifert, C. M., & Gonzalez, R. (2012). Assessing design heuristics for idea generation in an introductory engineering course. International Journal of Engineering Education., 28(2), 463-473. Davis, G. A., & Roweton, W. E. (1968). Using idea checklists with college students: over-coming resistance. Journal of Psychology., 70, 221-226. This tool can help you explore a problem in a systematic way by identifying the parameters of the challenge inherent within the problem. To use this tool you need to initially break the problem down into its various elements or dimensions. These elements or parameters can then be used as column headers with ideas relating to each separate parameter listed beneath the header. When doing this you don’t need to think about how the various elements match one another as this can be done later. For example, if the problem was to create an ‘optimal pen’ then possible elements/dimensions could be the shape of the pen, the materials used to construct it, the size, etc. Adding more dimensions creates the option of increasing the number of possible combinations, which in turn leads to more novel ideas. This tool has been used effectively in business and industry as a way of generating more novel ideas. Choon-Keong, T., Aris, B., Harun, J., & Kean-Wah, L. (2012). Enhancing and assessing student teachers’ creativity using brainstorming activities and ICT-based morphological analysis method. Academic Research International., 2(1), 241-250. Motte, D., & Bjarnemo, R. (2013, August 4-7th). Dealing with the combinatorial explosion of the morphological matrix n a ‘manual engineering design’ context. Paper presented at the International Design Engineering Technical Conferences & Computers and Information in Engineering Conference., Portland, Oregon, USA. These questions serve as ‘triggers’ for other new ideas and the instruction cues can be used in any order, sequence or combination, and need not all be used on one problem. Using this tool has been shown to lead to the generation of more feasible ideas that are rated as more novel. Lopez-Mesa, B., Mulet, E., Vidal, R., & Thompson, G. (2011). Effects of additional stimuli on idea-finding in design teams. Journal of Engineering Design., 22(1), 31-54. Moreno, D. P., Hernandez, A., Yang, M. C., & Wood, K. L. (2014). Creativity in Transactional Design Problems: Non-Intuitive Findings of an Expert Study Using Scamper. Paper presented at the International Design Conference, Human Behavior and Design., Dubrovnik, Croatia.